Today is the birthday (1778) of Joseph Louis Gay-Lussac, a French chemist and physicist, known mostly for his discovery that water is made of two parts hydrogen and one part oxygen (with Alexander von Humboldt), for two laws related to gases, and for his work on alcohol-water mixtures, which led to the degrees Gay-Lussac used to measure alcoholic beverages in many countries. Gay-Lussac was born at Saint-Léonard-de-Noblat in the present-day department of Haute-Vienne. His father, Anthony Gay, was a lawyer and prosecutor and worked as a judge in Noblat Bridge. He owned much of Lussac village and usually added the name of this hamlet, following a custom of the ancien régime. Towards the year 1803, father and son finally adopted the name Gay-Lussac. Gay-Lussac received his early education at the Abbey of Bourdeix, though later in life he became an atheist. Under the Abbot of Dumonteil he began his education in Paris, finally entering the École Polytechnique in 1798. Gay-Lussac narrowly avoided conscription and by the time of entry to the École Polytechnique his father had been arrested (due to Robespierre’s Reign of Terror). Three years later, Gay-Lussac transferred to the École des Ponts et Chaussées, and shortly afterward was assigned to C. L. Berthollet as his assistant. In 1802, he was appointed demonstrator to A. F. Fourcroy at the École Polytechnique, wherein (1809) he became the professor of chemistry. From 1808 to 1832, he was the professor of physics at the Sorbonne, a post which he only resigned for the chair of chemistry at the Jardin des Plantes. In 1821, he was elected a foreign member of the Royal Swedish Academy of Sciences. In 1831 he was elected to represent Haute-Vienne in the chamber of deputies, and in 1839 he entered the chamber of peers. He was elected a Foreign Honorary Member of the American Academy of Arts and Sciences in 1832. Gay-Lussac married Geneviève-Marie-Joseph Rojot in 1809. He had first met her when she worked as a linen draper’s shop assistant and was studying a chemistry textbook under the counter. They had five children, of whom the eldest (Jules) became assistant to Justus Liebig in Giessen. Some publications by Jules are mistaken as his father’s today since they share the same first initial (J. Gay-Lussac). 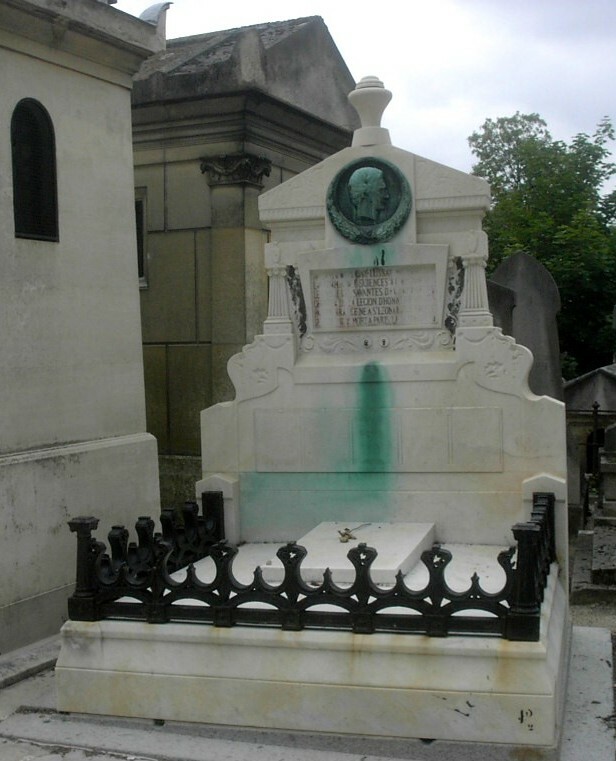 Gay-Lussac died in Paris, and his grave is at Père Lachaise Cemetery. His name is one of the 72 names inscribed on the Eiffel Tower. 1802 – Gay-Lussac first formulated the law, Gay-Lussac’s Law, stating that if the mass and volume of a gas are held constant then gas pressure increases linearly as the temperature rises. His work was preceded by that of Guillaume Amontons, who established the rough relation without the use of accurate thermometers. The law is sometimes written as p = k T, where k is a constant dependent on the mass and volume of the gas and T is temperature on an absolute scale (in terms of the ideal gas law, k = n·R/V). 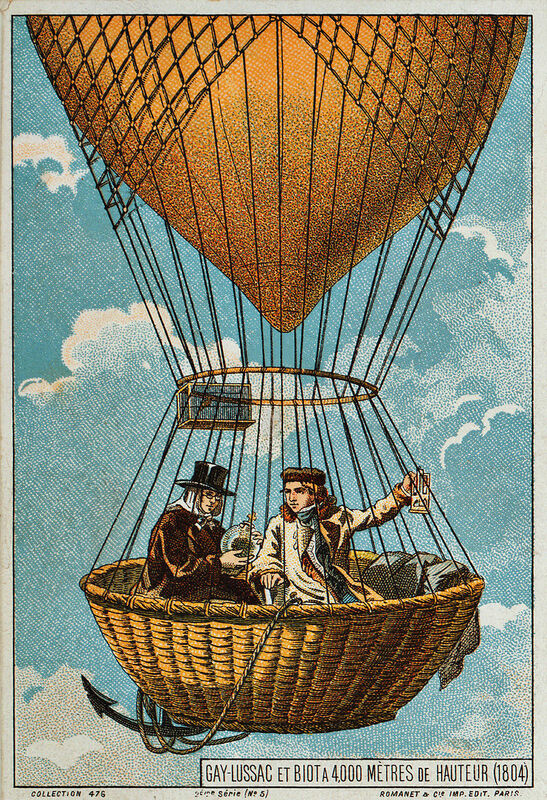 1804 – He and Jean-Baptiste Biot made a hot-air balloon ascent to a height of 7,016 meters (23,018 ft) in an early investigation of the Earth’s atmosphere. He wanted to collect samples of the air at different heights to record differences in temperature and moisture. 1805 – Together with his friend and scientific collaborator Alexander von Humboldt, he discovered that the composition of the atmosphere does not change with decreasing pressure (increasing altitude). They also discovered that water is formed by two parts of hydrogen and one part of oxygen (by volume). 1808 – He was the co-discoverer of boron. 1810 – In collaboration with Louis Thenard, he developed a method for quantitative elemental analysis by measuring the CO2 and O2 evolved by reaction with potassium chlorate. 1811 – He recognized iodine as a new element, described its properties, and suggested the name iode. 1815 – He synthesized cyanogen, determined its empirical formula and named it. 1824 – He developed an improved version of the burette that included a side arm, and coined the terms “pipette” and “burette” in an 1824 paper about the standardization of indigo solutions. Clafoutis, is a baked French dessert of fruit, from the Limousin region where Gay-Lussac hailed from. It is traditionally made with unpitted black cherries, arranged in a buttered dish and covered with a thick flan-like batter. The clafoutis is dusted with powdered sugar and served lukewarm, sometimes with cream. 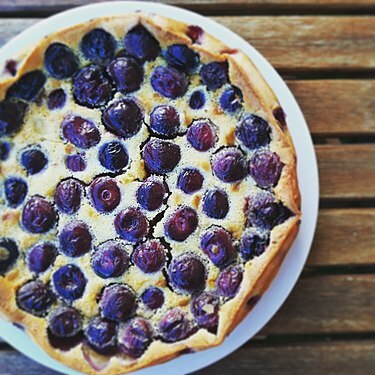 The cherry pits contain amygdalin, the active chemical in almond extract, so during baking a small amount of amygdalin from the pits is released into the clafoutis, adding a complementary note to its flavor. If you cannot find fresh, unpitted cherries, pitted will work. While black cherries are traditional, there are now numerous variations using other fruits, including red cherries, plums, prunes, apples, pears, cranberries or blackberries. When other kinds of fruit are used instead of cherries, the dish is properly called a flaugnarde. The dish’s name derives from Occitan clafotís, from the verb clafir, meaning “to fill” Clafoutis apparently spread throughout France during the 19th century. Butter and lightly flour a 9-inch round pie dish or cast iron pan. Combine the eggs, sugar, salt, milk, lemon zest, kirsch and vanilla extract in a food processor. Blend just until combined. Add the flour and blend again, just until combined and smooth. Finally, add the melted butter and pulse a few times to incorporate into the batter. You can mix the ingredients by hand, if you don’t have a processor. Pour the batter into the prepared dish. Top with the cherries. Bake in the preheated oven for 45 minutes to one hour or until the custard is just set. A toothpick poked in the center should emerge relatively clean. Do not bake too long, so that the custard is completely dry. When ready to serve, dust with powdered sugar. Serve warm.